Love-Lift Ministries began as a vision in the heart of a young child in the 1950's. Marilyn grew up in the home of pastor/evangelists Ira and Rhoda Heath. Missionary evangelists were a regular part of her life and because of their influence she soon felt the strong call of God on her life to serve Him as a missionary, especially to reach the very poor around the world with the Gospel of God’s love and His power to change lives. Marilyn loved Christian music and as a teen she served in her father’s church as pianist. Entering a Christian young people’s talent contest her State-wide first place position earned her a four year scholarship at Southern California College, now Vanguard University of Southern California, in Costa Mesa - www.vanguard.edu . After she was graduated from Vanguard in 1967 with a B.A. in music, and a teaching credential, she taught elementary school and music classes at Prince of Peace Lutheran school in Costa Mesa. During her summer vacations she traveled to over thirty countries. Seeing the needs of people living in cultures other than our own gave new life to her childhood missionary vision. In 1972 she married Philip Kunde who has worked as a Child Protective Services Social Worker for Los Angeles County since 1963. Chris Mills, Vice-President of the Love-Lift Ministries, shares Philip’s vision of helping abused and neglected children. Besides serving on the board of LLM Chris is actively involved with Royal Family Kids Camp - www.rfkc.org . In 1973 Marilyn retired from school teaching and became a full-time homemaker. In 1976 she was invited to become church pianist at Newport Mesa Christian Center in Costa Mesa - www.newportmesa.org . Finding no Women’s Ministry group at NMCC Marilyn felt led to organize a missionary support and sewing group, initially made up of three women. Jewel Wood, the wife of then pastor Dr. George O. Wood at NMCC - www.georgeowood.com - suggested "Dorcas" as the name for this group, after a New Testament woman who had a ministry of sewing for the poor. Because of God’s miracle in the life of Dorcas ... "many believed on the Lord." - Acts 9: 36 to 42. Today "Dorcas" is still serving the poor so that many are being led to "believe on the Lord. The early outreach of Dorcas/NMCC was to provide Christmas gifts for the children of missionary families visiting the church during their furloughs, and also to provide Christmas for the families of Wycliffe Bible Translators who regularly attended our home church - www.wycliffeassociates.org . In time Dorcas Women’s Ministry Group earnestly desired to enlarge their vision to reach out to missions beyond our borders, and to help missionaries and indigenous pastors serve their communities by delivering the Gospel in word and in deed. An opportunity to expand the outreach of Dorcas was realized when the Dorcas sewing group was invited to join forces with the Christian Missionary Pilots of Orange County - www.christianmissionpilots.org The CMP had developed a project of flying gift-bags of personal care items and toys, during the Christmas Season, to families on American Indian Reservation churches in remote areas of Arizona, California and New Mexico, and to Christian orphanages and churches in Mexico. The pilots called their project "The Love Lift." It soon became apparent that the need for gifts to be flown by the Pilots was more than the Dorcas Group could supply. The solution? Marilyn developed a plan; Dorcas would sew cloth bags for six categories: Boys and Girls, Teen-Boys and Teen-Girls, and Men and Women (later a category for Babies would be added). A colorful table, decorated with a Christmas motif, would be set up at Newport Mesa Christian Center just before Thanksgiving as the holiday season approached. Families, including children, would be invited to pickup a Christmas-Stocking or Gift-Bag from the Christmas display table. A uniform gift-list and a Christmas Card to sign would be included with each Gift-Bag. The Stockings or Bags would be filled by the congregation and then brought back to the church where the Dorcas Group would sort and group the Bags by categories: Children, Teens, and Adults. The Pilots would then fly these gifts to mission fields in Mexico and Southwestern American Indian churches. A Gospel booklet would be included with each delivery. The idea of giving church families an opportunity to bless needy families in a personal way, by age and gender- group of their choice, caught on. Participants were called "Love Lifters." The first Sunday when the Love Lift table was set up at church, all the Christmas Stockings and Bags were enthusiastically taken home to fill by church families, and more were needed. The Dorcas ladies energetically went to work sewing more Stockings and Bags. Before long a project which had joined a few dedicated ladies in one church and a small group of Christian Pilots began to grow, and to grow fast. Marilyn and the Pilots began speaking in other local churches and Christian Schools in Southern California inviting them to start their own Love Lift projects. Newport Mesa Christian Center - www.newportmesa.org - became Love Lift Headquarters and the place where other local churches and schools returned their filled Stockings and Bags. As before, the filled Stockings and Bags were sorted and grouped by the Dorcas Group, and hundreds were flown by CPM pilots to mission fields. Hundreds more were delivered, as arranged by Marilyn, using land transportation. With the program growing, airplanes alone could not do the job. During these early years Marilyn and her husband, Philip, traveled with Christian Missionary Pilot John Huntley on mission-vision trips to American Indian churches in Arizona, Bishop, California to the end of Baja, and to Central Mexico. By 1992 as many as forty churches of various denominations, and 13 Christian Schools had joined with the Headquarters Church at NMCC in filling over five-thousand Christmas Stockings or Bags, valued at about twenty dollars each for a total of over one-hundred thousand dollars given by participating Love-Lifters in 1992! After a meeting with CMP, following the successful Christmas 1992 Love Lift, it was decided that it would be desirable to separate our ministries, each having a different focus of service. Today CMP continues to have a Christmas Love Lift as one of their fly-out projects among others, such as flying in doctors and dentists, and construction workers to mission fields in Mexico and Arizona. Our ministry adopted the name under which we are now incorporated: Love-Lift Ministries. Marilyn assumed the position of director. Newport-Mesa Christian Center remained as the Headquarters and "umbrella" for the ministry. The Dorcas Women’s Missionary Group also continued to meet each Tuesday at the church, sewing and crafting gifts in support of LLM. Dr James Bradford - www.jamestbradford.com - was now the pastor of NMCC, Love-Lift Headquarters. 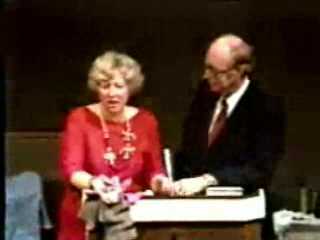 In the summer of 1994 Marilyn, her husband and son Christopher traveled 8,000 miles by motor home following missionary John Huntley for over a month visiting scores of village plazas and presenting the Gospel using puppets, music, a Spanish language film, and an indigenous pastor to offer the salvation invitation. During this trip we traveled to the jungle at the southern end of the Mexico, and were stopped once on the road for eight hours by revolutionary peasants, finally making a miraculous escape. We delivered hundreds of Love-Lift gifts to encourage village church congregations and their pastors during this exciting trip. Seeing first hand the needs of the people, and meeting Christian leaders serving in isolated areas, gave new impetus to Marilyn’s vision to do what she could to encourage Christian leaders who were ministering to needy people under harsh conditions. By 1996 the LLM program had evolved from an annual seasonal Christmas program into an all year long program. Love-Lift Ministries’ unpaid volunteers were now working every week of the year to fill Christmas Stocking and Gift-Bags from an inventory of items purchased, or donated by Love-Lifters. Financial donations, and donations of material goods, were meeting our needs, but just enough each month. Every month continues to demonstrate God’s miracles at LLM. We are reminded of the miracle of God’s daily provision of food to feed the Children of Israel in the wilderness - enough to meet each day’s needs, but never more than enough. By 2002 we were ready to make another major change. With the patient help of real estate broker, and soon to be Board Member, Loraine Webster, we searched far and wide to find a new warehouse and office facility where we could spread our wings and get ready to fly. We found just the place on MacArthur Boulevard near Calvary Chapel, Santa Ana. Acting in faith we rented the new facility, a considerable stretch in our monthly budget. The next step was to form an ad hoc committee to explore the possibility of forming an independent, non-profit organization. A board of directors volunteered from within the committee membership, and the board was approved. Marilyn was named as Founder President.